Did you know that childhood cavities are the most common, chronic childhood disease? But, on the bright side, they are also almost entirely preventable. The first place to start is with your child’s baby bottle. 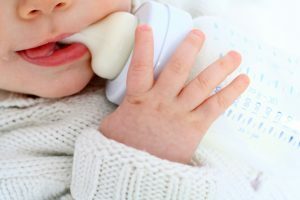 This sort of decay happens during infancy as you can tell by the name “baby bottle tooth decay.” It is usually noticed on the upper and lower front teeth, though other teeth may also get affected. This is caused due to prolonged contact with sugary substances or fluids including candy and chocolates, milk or formula given using bottes. There are high chances of tooth decay if your baby sleeps with a bottle in his or her mouth or if a bottle is used as a pacifier regularly. Tooth decay can also be caused due to lack of water intake by your baby (older than 6 months of age). Keeping your infant cavity free! Follow the recommendations below and you will be on your way to help keeping your infant cavity-free! Putting fruit juice or sports drinks in your infant’s bottles is not recommended. High amounts of sugar can lead to tooth decay and cause more dental problems as their teeth begin to appear. Cavities in baby teeth can also lead to complications in adult teeth later on. With damp, clean cloth, wipe out your child’s mouth after each meal, liquid or solid. Doing this keeps their mouth free of sugar and other bacteria that can lead to cavities. While a bottle may comfort your child it can be very damaging for their gums and developing teeth. When left in their mouth, sugar from breast milk, formula or milk can lead to infection and pain. Try to establish a bedtime routine that doesn’t involve a bottle. And let them have a drink of water before bed. As your child begins walking, they’ll also begin falling which is why you shouldn’t let newly mobile children walk with their bottle. Children fall easily, especially when they are learning how to walk. You can avoid this by not letting them walk around with a bottle and having them sit while they drink. Establish a dental home early for your child before their first birthday. Familiarizing them with a pediatric dentist early on will help them get more comfortable visiting the dentist and keeping their teeth clean. Columbus Pediatric Dentist Dr. Hines and the Hines Little Smiles teams is a comfortable, friendly place to take your little ones. We are experienced and look forward to helping you find the best treatment needed. Contact us today!